Finished in heavily distressed Charleston Place on select hardwoods and veneers. This handsome cabinet features a large center ring pull on the door, large corbels, and bun feet. Locking front door slides in both directions for convenient access to the shelves. Halogen lighting for brighter, whiter, longer lasting light to illuminate your collectibles. A glass mirrored back enhances the view. 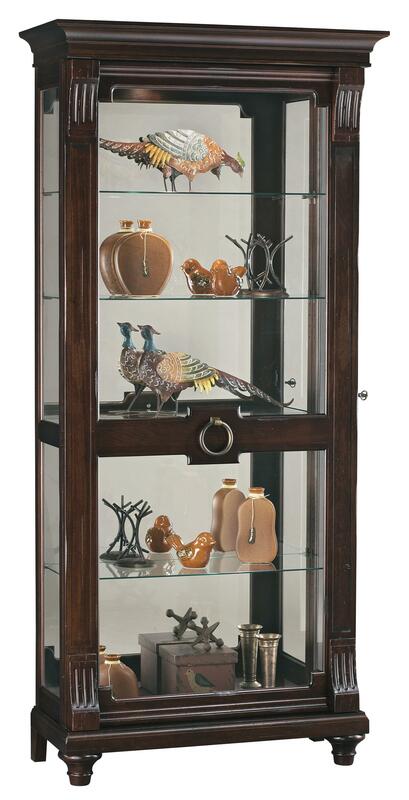 Four adjustable glass shelves for five levels of display with continuous holes for shelf adjustment. Adjustable levelers under each corner provide stability on uneven and carpeted floors. No-Reach™ roller light switch for interior light is conveniently located on the back of the cabinet. Pad-Lock™ cushioned metal shelf clips increase stability and safety. The Curios Brenna by Howard Miller at Prime Brothers Furniture in the Bay City, Saginaw, Midland, Michigan area. Product availability may vary. Contact us for the most current availability on this product.